It’s 11:17pm and I just sat down to write this post. It’s awfully convenient that the day I have little to no time to write is the day I have not a lot to say, if you can’t feel the sarcasm dripping from the sentence I’ll just subtly point it out. So I have good reasons for not getting round to it until now and no I wasn’t procrastinating, although that does sound like something I would do. I spent the day sewing then at a family gathering and I just assumed I’d be back about 8-9ish but here we are 11:30, I would much rather be curled up with a hot chocolate watching a film or even in bed but the show must go on, I’m on a bakemas mission. 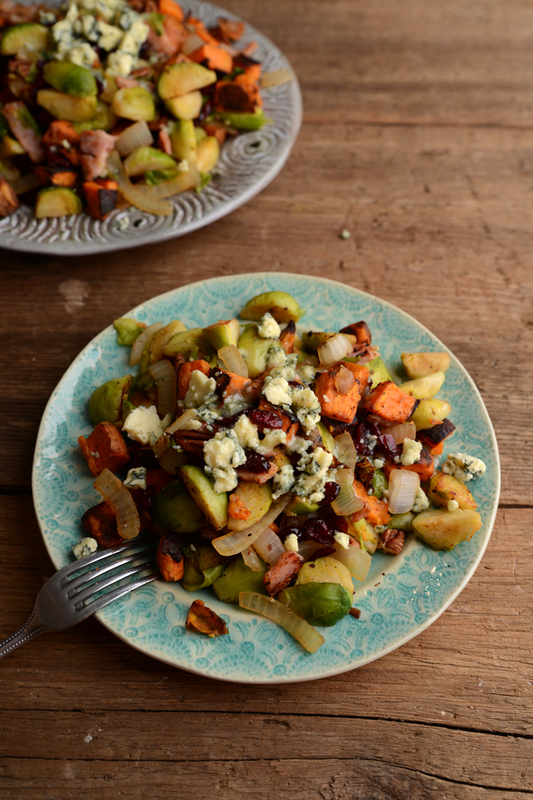 So brussel sprouts, are we yay or nay? Are they like marmite you either love them or you hate them? I remember not liking them as a child, however I’m not sure if that’s because they have the whole stigma surrounding them so I never really gave them a chance or if my baby taste buds couldn’t handle them. 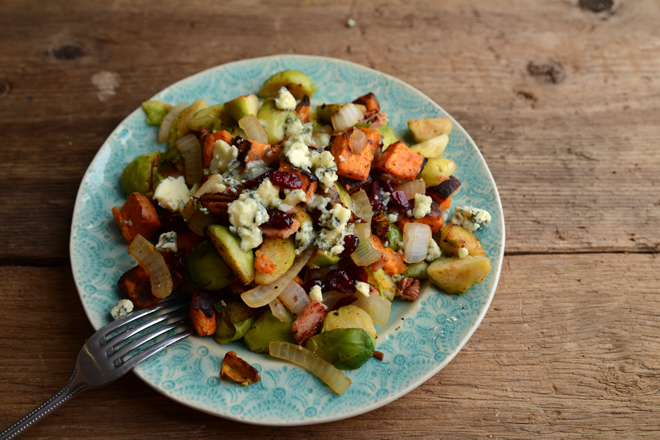 I think brussel sprouts are a little like coffee, the majority of people could like it if they work out how they like it, that’s code for embellish and it’ll probably taste good and you’ll eventually learn to like it on its own. 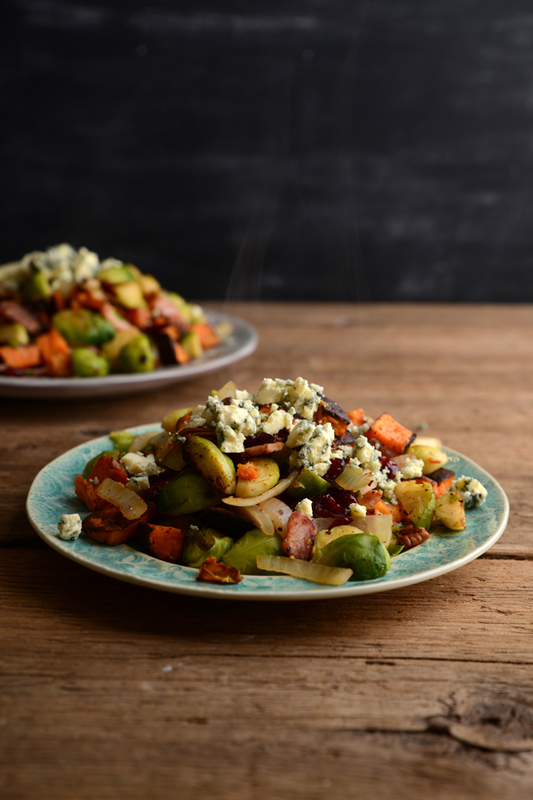 My mum makes a brussel sprout and bacon salad for Christmas, which seems to be quite a popular Christmas day side dish, but I decided it just needed more. This could easily be used as a side or a main but I’ll warn you now picking at this salad is a problem. I ended up picking at it so much that by the time I sat down to eat dinner I wasn’t even hungry. Wash and cut the sweet potato into chunks, bowl lightly coat the potato with oil and season well with salt and pepper. Pour onto a baking tray and cook for 20-25 minutes until soft and crispy. While the potatoes are cooking, cut off the stem peel and quarter the brussel sprouts and put them in a saucepan of boiling water for 3 minutes. After the 3 minutes drain and run under cold water. 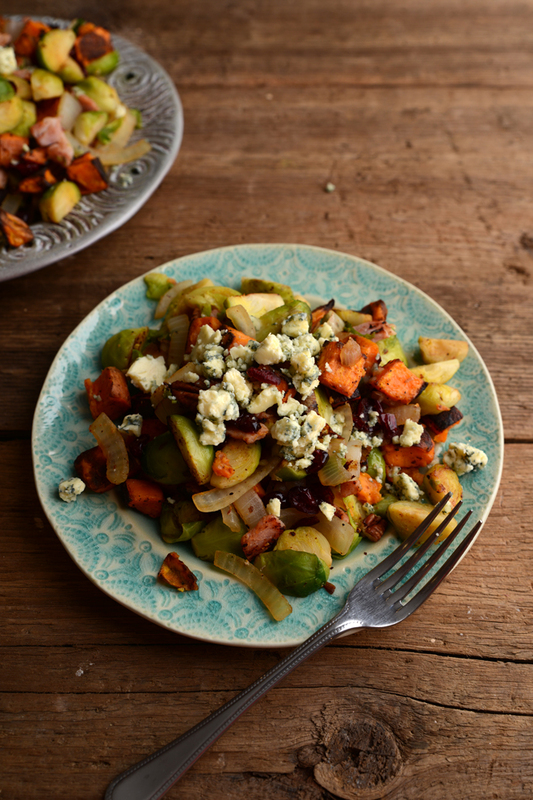 In a frying pan with oil cook the bacon and onion until almost cooked, add in the brussel sprouts and cook for a further 5-10 minutes until the sprouts are golden brown, add in the sweet potato pecans and cranberries, (if using) and combine, serve and top with blue cheese.